Thank you, one and all, for participating in my poll on mandated sick leave. Forty-five percent of respondents said it would significantly increase restaurants’ operating costs. Another 45 percent said it would make no difference, and one person said it would significantly decrease operating costs. Since only 11 people participated in the poll, however, that one person accounted for 9 percent of total votes. Of more interest, I think, were the insightful comments this blog's readers made. You you can look at or add to them here. Machinations are underway for a new poll on Monday. It should be a doozy, so stay tuned. I’m happy to report that the past 500 visitors to this blog came from 32 different U.S. states, four Canadian provinces and eight other countries, but 68 of you (that's 13.6 percent) came from New York. So for my next poll I'd like to address an issue concerning local restaurants, that of mandated paid sick leave for workers. 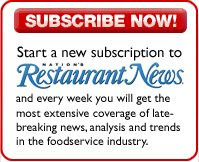 The New York City Council’s considering such a measure, and so of course we at Nation’s Restaurant News are writing about it. And one of my colleagues wants to ask you what you think. For some background information, click here. Pleas click what you think on the upper right hand corner of this blog, and, as always, feel free to write comments below, too. Oh, you cynical, cynical blog readers. Another 17 percent clicked on “Because they want to help protect the environment. What dark souls you must have. On the other hand, it’s not like our environment has only been imperiled since Al Gore made a movie about it. I was writing about global warming in college, in the late 1980s. Air and water pollution? Tom Lehrer was singing about it in the 1960s. What has changed? Now environmentalism is cool. So I guess you have a point. I’m afraid I don’t have another poll ready for you, but when I do, you’ll be the first to know. Danny Meyer's much-anticipated Roman trattoria at Ian Schrager's Gramercy Park Hotel opens tomorrow, according to a press release that landed in my e-mail box at 2:40 p.m. Reservations (212-777-2410) will be limited, initially, though walk-ins are welcome. The restaurant will only be serving dinner for the next couple of weeks, but management plans to start serving breakfast in December, and lunch in January. But of course it all depends. Danny Meyer's Union Square Hospitality Group is perhaps the most respected restaurant company in New York — possibly even in the country — but I don't know of any opening it's had without a glitch or two. The genius of the company is that it sees the hiccups and fixes them in short order. The chef is Nick Anderer, a veteran of Danny Meyer's organization, having most recently cooked at Gramercy Tavern (for the past six years). Before that he worked in Milan at San Giorgio et il Drago, and before that he was at Mario Batali's flagship, Babbo (and made it into Heat, Bill Buford’s book about cooking there). He also worked under local-seasonal pioneer Larry Forgione. General manager Terry Coughlin most recently was GM at another Danny Meyer place, Tabla. I bet there will be much talk of the restaurant tomorrow night at 11 Madison Park, Meyer's four-star restaurant, which is celebrating its 11th anniversary with what I assume will be a blow-out party. I know I’m looking forward to it. Starting out the week by doing a good deed, because I rarely hear from restaurateurs themselves instead of publicists (true story: one publicist today sent a press release to me about an image consultant, noting the importance of a first impression, and then sent out a correction because she had misspelled her client's first name), I’d like to help out Astoria restaurateur Yann Henri (non-New Yorkers, Astoria is in the borough of Queens), who says he opened a little French place called Bistro Les Minots last March at 47-16 30th Avenue (non-New Yorkers, that’s what Queens addresses look like, and they’re quite brilliant; the number before the hyphen indicates what cross street it’s near). The owners are French, from Paris and Marseille, and the menu is traditional French bistro fare. They serve a $16.95 prix-fixe lunch and a $19.95 prix-fixe dinner. They also have a $19.95 all-you-can eat moules-frites special on Monday. The restaurant’s phone number is 718-606-2535. This message has been brought to you by the fact that I’m in a good mood today. Well, my latest poll was a dud. I asked readers of this blog if they or their customers had changed their food-sharing habits due to fears of the H1N1 virus. Only seven people responded. Five said no, two said yes, everyone else, by their lack of response, I guess were indicating that they hadn’t thought about it or weren’t interested in the question. Here’s another one for you, from another of my colleagues, about restaurants’ moves to engage in more environmentally sound practices. I went to some good parties last week, including two book parties. I don’t go to book parties much, because we don’t have much use for cookbooks at NRN — occasionally we can use art from them, but that’s about it — and I personally like to cook based on what’s on hand. If I have questions about specific technique I just grab my battered copy of The Joy of Cooking. But on Wednesday, after going to the see-and-be-seen party at The Four Seasons to welcome its new chef, Fabio Trabocchi (the most interesting person I met was a writer and publicist with the unlikely name of Paxton Quigley, author of Armed and Female, a self-help book instructing women how to use guns to protect themselves), I went to the East Village for the launch of the Veselka cookbook. So I went from really lovely Champagne and foie gras and truffles to cheap red wine and pierogis, but I like pierogis and haven’t met many wines I can’t drink (I do remember one, boasting that it was made from 100 percent grapes! that was kind of hard to get down). So I chowed down on pierogies and borscht and meatballs and ran into my old colleague Craig Waters (his byline is C. Dickinson Waters, in case you want to look for it), who now works on the business end of Macmillan, which published the Veselka book. Then yesterday I went to a packed event celebrating Marcus Samuelsson’s new book, New American Table. The party was sponsored and thrown by HSBC bank, which I remember from back when it went by its full name, Hongkong Shanghai Banking Corporation. Now, of course, it’s going for more universal appeal. A lot of bankers were at the party, including a nice one with whom I spoke about travel to Southeast Asia. But some chefs were there, too, including Alfred Portale from Gotham Bar & Grill and Nils Noren from the French Culinary Institute, who for many years was Marcus' executive chef at Aquavit. Anita Lo, of the once and perhaps future Annisa and the current Rickshaw Dumpling Bar, was there, too, and I had a long chat with chef, consultant, writer, etc. Robert Danhi, who moderated a panel I was on a couple of years ago at the National Restaurant Show. It was about Asian food trends. Robert, who's based in Southern California, is married to a Malaysian woman and travels back and forth to Southeast Asia a lot. So we talked about his love for durian, my inability to appreciate it so far, the joy of a good mangosteen, and other things. Marcus came by and ripped off my nametag in disgust, wondering why a bank would make us wear such things. He did it in a really friendly way, though. Marcus is good people. I wasn’t so sure about people I’d met earlier in the week. At one dinner I sat next to a woman who expressed shock and almost disgust that I would admit to liking science fiction. She liked realistic things, she said, because she was a Virgo. I asked her, then, about her belief in astrology, and she readily acknowledged the contradiction, so maybe she wasn’t so bad. But still, who at a civilized dinner would show disgust for someone else’s taste? It’s not nice. But speaking of Robert Danhi, I did have good Southeast Asian food at the Beard House last week, where Mohan Ismail, the chef of Rock Sugar, was cooking. Rock Sugar’s a Southeast Asian restaurant in Los Angeles that’s the little brother of Cheesecake Factory. Ismail, who’s originally from Singapore — click here if you’d like to read a whole profile and interview of the guy, written by my colleague Lisa Jennings — but the salient point for this story is that he was on the opening team of Spice Market in New York’s Meatpacking District, and so was Pichet Ong, who was also at the Beard House, helping Mohan. Pichet told me a little about his new dessert shop that’s opening soon on St. Mark's Place. He said it would be a masculine dessert shop, rather than all the frilly and feminine ones that are out there. He said the only other masculine dessert place in town was Max Brenner’s, but Pichet’s consulting with Max these days, so he’s biased. Side dishes for the table: Coconut rice with lemon grass, pandan leaves and cashews, and nonya sambal eggplant with sweet soy and chiles (“Nonya” is a Malaysian word for “grandmother” and also refers to the Peranakan cuisine of what are known as the Straits Chinese of Peninsular Malaysia, and Singapore, who are the descendants mostly of Chinese immigrant men who were imported by the British to work in the tin mines and married Malay women; the food is those women’s attempts to make Chinese food, which naturally included incorporating local ingredients, techniques and sensibilities).